Teeth partials, also known as a partial denture are removable replacement teeth. Teeth partials are ideal if you have a combination of missing and retained natural teeth. 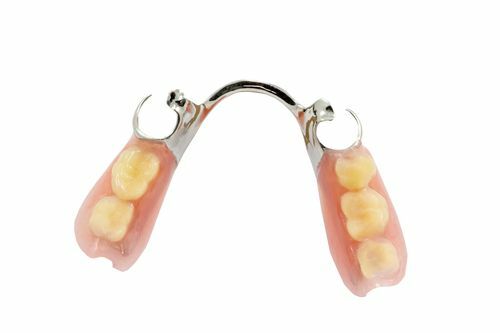 Removable teeth partials have tooth colored acrylic replacement teeth and retentive metal clasps or rubber like gasket openings on the partial denture that enable the partial to be placed over your remaining natural teeth and rest on the bone ridge (jawbone). With proper handling and care, teeth partials often last several years. Gum disease is the number one reason adults have a tooth extracted. Gum disease is a chronic condition that results in the loss of bone supporting structure to retain a tooth in the jawbone. Other reasons a tooth is loss is due to decay that extends into the tooth’s nerve, or an unrestorable broken tooth. drift and could lead to loss of additional teeth if extracted teeth are not replaced. Teeth partials enable you to fill unsightly, visible missing teeth spaces and help prevent teeth adjacent to the missing tooth space from shifting and drifting. A teeth partial consists of a base made of either acrylic or a metal framework with acrylic or porcelain replacement teeth. Teeth partials may have metal clasps that wrap around natural existing teeth or openings with rubber like gaskets that hug remaining natural teeth. Teeth partials use existing natural teeth for retention. If additional natural teeth are ever extracted, a partial denture can be converted into a full teeth replacement denture. Pictured above: Pictorial comparison of difference between a full denture and teeth partials. to teeth partials: dental bridge or a dental implant. Which option is right for you is dependent upon many variables including the number of teeth replaced, height on bone ridge, aesthetics, time, and cost. A dental bridge is a great alternative teeth on each side of the missing tooth are healthy. A dental bridge consists of three or more dental crowns fused together (pontic and abutments) and is permanently cemented over two or more natural (abutment) teeth. that replaces the missing visible portion of the tooth. Abutments are the adjacent natural teeth that support or anchor the pontic tooth. 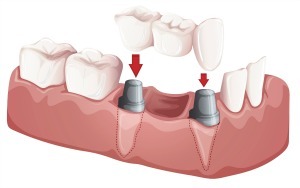 The abutment and pontic crowns are fused together as one in the fabrication process. Dental bridge aesthetics look like natural teeth. They are custom shaded to blend in with adjacent natural teeth. Dental bridge care includes brushing and using a bridge threader to clean under the bridge. Dental bridges last several years and are a viable option to replace missing teeth and to restore chewing without having to remove a teeth partial. dental implant is a total tooth replacement comprised of a titanium tooth root and a visible porcelain, tooth colored dental crown. The dental crown is permanently cemented to the titanium tooth root. Similar to a dental bridge, dental implants are tooth colored and will last several years with meticulous home care. 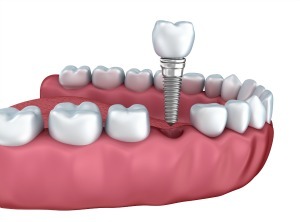 The procedure to place a dental implant includes multiple appointments over a period of 6-12 months. Generally speaking, the dentist will first place the dental implant and ongoing monitor the healing process which can take several months. After healing is complete, the dentist will proceed to place a metal coping to support a permanently cemented dental crown. Dentistry for the Entire Family offers complimentary smile restoration consultations. Discover what your options are. Call (763) 586-9988 or click the green button below to request an appointment online. What are teeth partials made of? for our dentists. Teeth partials are made of acrylic (plastic) inset with the patient’s choice and shade acrylic colored teeth. Teeth partials also have additional metal or acrylic support clasps or gaskets that wrap around natural teeth for retentive support. 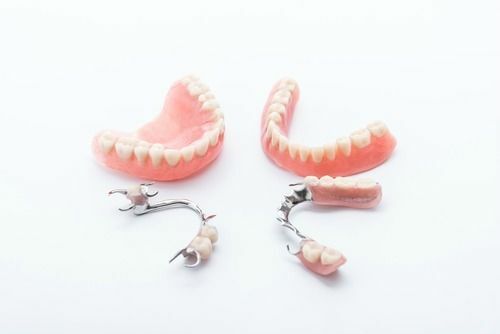 The actual fabrication of the teeth partial denture itself requires the dentist to take a series of dental impressions, measurements, and selection of aesthetic characteristics to enable the dental lab technician to fabricate your new teeth partial. The partial making process requires a sequential series of appointments as the dental lab technician completes each fabrication step of your new teeth partial. These appointments are often called “try in” appointments. The number of appointments necessary varies among individuals. Additionally, after the final teeth partials are fabricated and fitted, there will be additional follow up visits to manage the inevitable “sore spots” that will surface. It is important to maintain preventive care visits with your hygienist. At each preventive care visit, your dental hygienist will professionally clean your partial and your dentist will inspect and check the fit of your partial. 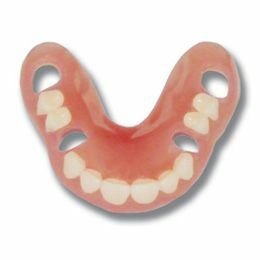 ***Do not use over the counter denture cleaners if your partial has gaskets. This will cause your gaskets to dry out, become brittle, and will affect the fit of your partial. Smoking and/or use of smokeless tobacco may stain your partial and overtime permanently alter the brightness of your partial’s teeth. There are over the counter cleaners to help reduce unsightly stains. Accidents happen, materials age, and over time the fit of your partial may change the fit of your partial. If scheduled in advance, your teeth partial can be repaired and/or relined in a single day. Call (763) 586-9988 to preschedule a 10 minute early appointment and a 10 minute late afternoon appointment. Doing this, will minimize the time you are without your partial. A reline is a procedure that restores the fit and extends the life of your partial. Over time, the supporting bone ridge in your mouth changes and alters the retention of your partial. The dentist will take an impression of both your mouth and of your existing partial. Your case will be sent out to our dental lab where a dental lab technician will clean, inspect, and restore the fit your partial fit. Most teeth partial repairs can be completed in a single day. Call (763) 586-9988 to schedule an appointment. ***Do NOT attempt to repair your partial with an over the counter adhesive like super glue. These products are not safe for use in the mouth. Q. How much are teeth partials? A. The cost of partials depends on many factors. Your dentist will discuss your options and will one of our patient care coordinators will provide you an estimate of costs for you to make an informed decision. Q. Are teeth partials covered by my dental insurance? Q. How long does it take from start to finish to have a partial made? A. The process to make a partial involves several steps and is different for each person. Dentistry for the Entire Family offers complimentary consultations for you to meet and discuss your specific situation with a dentist. Discover what your options are. 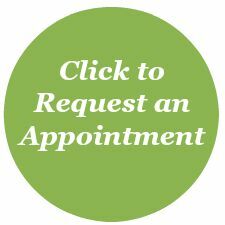 Call (763) 586-9988or click the green button below to request an appointment online.